In November 2012, Mercy-USA for Aid and Development, through our local partner Foundation for Economic and Educational Development (FEED), provided winter kits to 1,350 families (about 3,400 persons) that were displaced by flooding and communal riots in the Indian province of Assam. Each kit consisted of one blanket, one sheet and 2 pieces of clothing. During October and November 2005, Mercy-USA, through our partner in India, United Economic Forum (UEF), distributed about 3,700 corrugated galvanized iron (CGI) sheets (traditionally used as roofing material) to 285 earthquake-affected families (about 2,000 persons) living in seven villages in Indian-Administered Kashmir. These families used the CGI sheets along with wood beams that they retrieved from their damaged or destroyed homes to build semi-permanent shelters to protect them from the harsh winter weather. From January to March 2005, Mercy-USA, through our local partner, United Economic Forum, distributed food packages (containing rice, lentils, oil, sugar, tea, etc. ), kitchen kits (containing pots, pans, plates, bowls, cups, utensils, etc. ), clothes, plastic tarpaulins, ceiling fans for temporary shelters, sheets and blankets to approximately 2,000 families left homeless by the tsunami in the states of Andhra Pradesh and Tamil Nadu. From October 2004 to April 2005, Mercy-USA, through a grant to our local partner organization AFMI Charitable Trust (AFMI-CT), funded the expansion of AFMI-CT’s hospital in the city of Baroda in the State of Gujarat, India. This expansion included the addition of a new floor to the existing structure with a new operating theater, specialty treatment rooms, 23 more patient beds, new defibrillator, other medical equipment and furniture. With this expansion, the hospital is now able to provide health services to approximately 22,000 patients annually, most of whom are low income and cannot afford such services at other medical facilities. In 2000, Mercy-USA helped this hospital with the purchase of an X-ray machine. 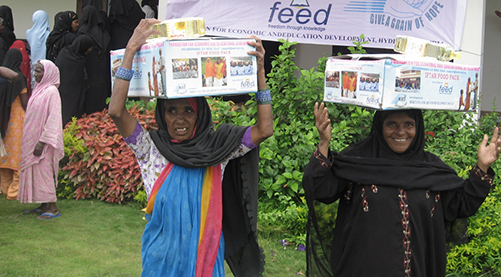 From August 2002 to June 2003, Mercy-USA for Aid and Development, through our local partner organization United Economic Forum (UEF), helped 262 families in 12 villages in the State of Gujarat in western India to rebuild or repair their homes, which were damaged during ethnic rioting. Families received bricks, cement, doors, windows, pipes, and zinc sheets for roofing. From May to June 2002, Mercy-USA, in partnership with UEF, distributed 3,700 household/kitchen kits to 3,700 homeless families. The average household/kitchen kit included a kerosene camping stove, bucket, 5 pots and pans, 12 plates and bowls, 9 cups, kettle, rolling pin, 37 utensils, a pair of slippers, towel, bed sheet, comb, bar soap, teeth cleaning powder, etc. In 2001, Mercy-USA, through UEF, distributed 995 tents, 10,000 blankets, food and medicine to approximately 10,000 earthquake survivors in Gujarat. In February 1999, Mercy-USA provided a grant to another local Indian charity, Al-Ata Vocational Training Centre for Women, to assist them with the purchase of a new building to house their main vocational training center in Hyderabad.